DONATIONS - Mission Thando Inc. DONATIONS: Your support makes it possible for this ministry to keep touching lives!!! Thank-you!! Mission Thando Inc. is a registered Charity in Canada. All donors will receive an income tax receipt!! 2.To set up monthly debit payments download the form below. Fill in the information and send the form to: P.O. Box 997 Weyburn SK, S4H 2L2. 3. 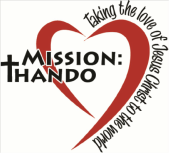 PAYPAL -Make a Donation to Mission Thando Today! !